Coconut Water is the nutritious clear liquid inside the coconut fruit which is packed with vitamins and minerals. 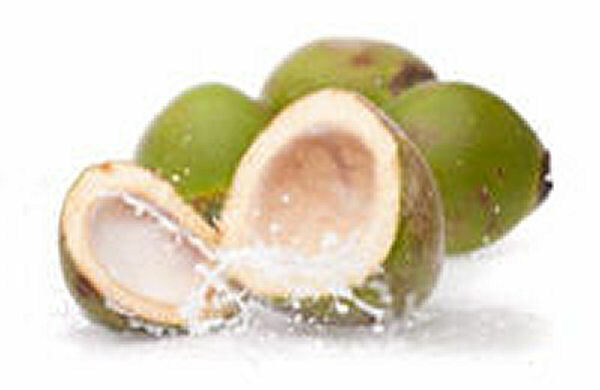 There is usually more water in a young coconut, since the water is replaced by the white coconut flesh as it matures. Therefore, for drinking purposes, coconuts are harvested off the trees when they are still young and green. Later, the outer green husk is removed and the coconuts are wrapped in plastic to keep the moisture. For best results, the water from a fresh coconut should be consumed shortly after being exposed to air due to the possible loss of important nutrients. A single coconut usually provides an 11 ounce serving of water, and it is low in calories and fat but rich in vitamins, minerals and other nutrients. A few key nutrients in Coconut Water include Lauric acid, Chloride, and Iron, as well as important electrolytes such as Potassium, Magnesium, Calcium, Sodium, and Phosphorous. In fact, the potassium content in Coconut Water is close to twice the amount in a banana. A healthy balance of electrolytes is important for the optimal health of our muscular, cardiovascular, nervous and immune systems, as well as to help with the absorption and balance of the body's internal fluids. Many studies have shown that the antiviral, antibacterial, anti-inflammatory and antioxidant activity of Coconut Water may help with a number of minor to severe health conditions. This nutrient rich drink has been used to regulate blood pressure, blood sugar, and cholesterol levels, and it has been found to boost energy levels and increase metabolism in the human body. Other conditions that it has been found to be effective at treating include stomach flu, dysentery, indigestion, constipation, intestinal worms, cholera, urinary abnormalities, urethral stone, malfunctioning kidneys, dry and itchy skin, age spots, and wrinkles. Researchers have found that Cytokinins help regulate the cell growth and their divisions. Coconut Water contains these cytokinins and lauric acid which can minimize the aging of skin cells, balance PH levels, and keep the connective tissues strong and hydrated. Therefore, simply applying Coconut Water onto affected skin areas every night before going to bed may help with acne, age spots, wrinkles, stretch marks, cellulite, and eczema. Abundant in vitamins, minerals and other nutrients, Coconut Water makes a wonderful energy drink. In particular, coconut water has less sugar and sodium content compared to most sports drinks, while packing more Potassium, Calcium, and Chloride, which makes it a better choice to rehydrate, replenish and boost the body's energy levels after any strenuous activity or workout. For example, in every 100ml of Coconut Water there is approximately 294mg of potassium compared to 117mg in an average energy drink, 25mg of sodium compared to 200mg in energy drinks and 41mg in most sport drinks, 5mg sugar compared to 20-25mg, and 118mg of chloride compare to 39mg in average energy and sport drinks. According to researchers, individuals with high blood pressure usually have low potassium levels. Therefore, drinking coconut water on a regular basis can be quite effective at regulating blood pressure due to its high concentration of potassium and lauric acid. Similarly, some recent studies have found that coconut water can help increase HDL (good) cholesterol, which makes it a wonderful natural treatment for maintaining good cardiovascular health. Rich in Potassium and other minerals, Coconut Water helps to regulate our internal fluids and replenish and rehydrate the body. It has been used to treat dehydration caused by dysentery, cholera, diarrhea and stomach flu, and the electrolyte balance and plasma in Coconut Water has been found to be similar to that of human blood. Therefore, drinking one cup of Coconut Water twice daily during digestive tract abnormalities, hot temperatures, and after strenuous workouts can help rehydrate the body quickly. Coconut Water contains Lauric acid which our body converts into monolaurin. Monolaurin has great antiviral, antiprozoal and antibacterial activity which helps fight against intestinal worms, parasites, lipid-coated viruses and other gastrointestinal tract infections in children and adults. 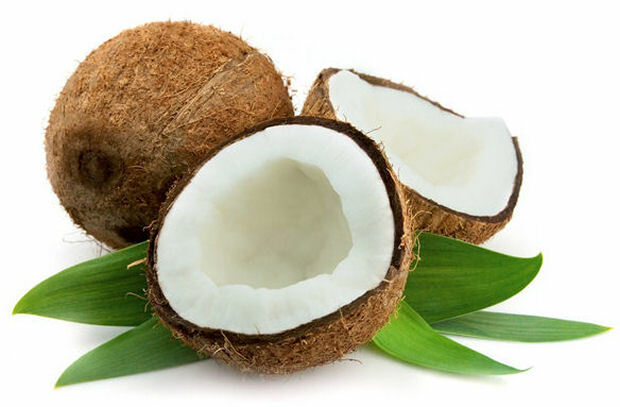 Additionally, the water from coconut may not only act as an antibiotic but it can also rehydrate the body. Therefore, a simple remedy for Intestinal Worms is to mix one teaspoon of extra virgin olive oil into a cup of Coconut Water and drink it daily for at least three days. For constipation, diarrhea and other common digestive problems drink one cup of Coconut Water twice daily. Coconut water is a natural electrolyte and isotonic beverage which help increase the body's metabolism. Therefore, it can greatly benefit people who are struggling with weight issues. What are the Side Effects of Coconut Water? Fresh Coconut Water is one of the best natural drinks on the face of the earth. It doesn't have any known side effects unless somebody is prone to having allergic reactions or have severe nut allergies. It is considered to be safe for children, pregnant, and breastfeeding women. If you are taking potassium supplements it is recommended to regulate your potassium levels since Coconut Water is high in potassium. Coconut Water is readily available in cans or bottles from many grocery stores or online retailers (see below). Fresh plastic wrapped coconuts can also be purchased at many Indian and Asian grocery stores during the summer. When buying fresh coconuts with green husks, look for those with some light brown spots as well since these are considered to have the greatest water content. Generally, the water from Indian and Bangladeshi coconuts tends to be sweeter than Thai and Brazilian coconuts. When using fresh coconuts, try to drink the water as soon as possible since the nutrients can begin to dissipate after being exposed to air. However, the water can also be refrigerated for 10 to 12 hours if it is sealed in a tight container. This amazing oil is a wonderful natural treatment for many skin problems. Fresh coconut water will work. I started drinking coconut water a few days ago for my stomach inflammation which I've had for almost two years. I take it early in the morning on an empty stomach but am wondering if I should also take it before, or after a meal. I only drink about 1/2 a cup of it right now. If you know the answer please let me know. Thank you. I have bought Freeze Dried Coconut Water 500 mg from Amazon and I take one per day after a meal. Would this have the same benefits as the pure Coconut water/milk? Now we know where to buy it in South Africa, it's available in ALDI's in Switzerland. I think you can also find it in Coop and Migros and possibly OTTO's and Denner. Good Sipping! Mere/Mother'line: Why don't they try coconut oil mixed with a little Pure Olive Oil? It's better for them than yogurt, unless you can find that lactose free. Sapna, I have fractured shoulders! How much coconut water do you recommend for me? I can buy cartons of 330 ml. I could drink it 24/7 but can I drink too much? I would just love to become addicted to it. Any chance? Recently I lost 14 kilos! Now I have discovered coconut water which I couldn't get before, there's nothing stopping me from going down to a weight of ONE KILO... I am joking of course. WHY on earth would you want to dilute coconut water with ordinary water?? That would not make any sense at all! Why mix something deliciously good for you with anything? It is not GIN which requires the addition of something. It is not WHISKY which also should be diluted. IT IS 100% PURE NATURAL WATER FROM COCONUTS. THEY GROW ON TREES DEAR! You do as you wish; but mixing ordinary water with a delectable extract from trees, doesn't make any sense. Hypertensive patients need 8 ounces of fresh, organic coconut water to regulate muscle function and to reduce elevated systolic pressure. I can drink at least 2 litres of coconut water a day. Is this too much? In reply to a question someone posted about where to buy coconut water in South Africa: Coconut water is available in South Africa at Dischem as well as some Woolworths stores.